a great live show with a crowd that was loving it, plenty of crowd surfers, and of course great music. The Imaginaerum tour has run for more than a year, and has seen major changes in the band. Singer Anette Olzon left the band and Floor Jansen stepped in as a temporary replacement to enable the band to finish the tour. Since the tour ended Floor has been made a permanent member of the band, and long-time collaborator Troy Donockley has also been given full member status. 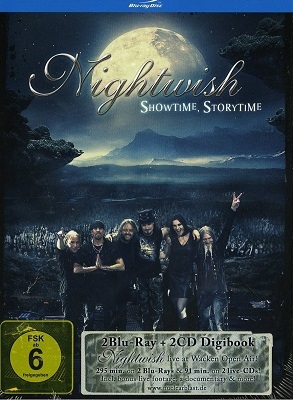 During the tour Nightwish put on shows around the world, and brought the tour to an end with a performance at Wacken Open Air in front of more than 80,000 fans. That show was filmed by multiple cameras and recorded and is now being released as a DVD/Blu-Ray. Whether you opt for the DVD or BluRay its an impressive package – two DVD’s plus 2 CD’s. They’re contained in a hardback book-style case along with the booklet which consists of loads of photos of the band at Wacken and elsewhere on the tour. The first DVD contains the show itself. Recorded in high quality 5.1 surround sound, and filmed in high definition from multiple cameras, this is a great quality live show. Being a festival meant that some of the stage show differed from parts of the tour, but being Wacken there is plenty of pyro with lots of flame jets. Watching the show you can see how much Floor in particular, and the whole band, are enjoying themselves playing to the huge crowd. I was at Wacken and saw the show live, and the DVD does a great job of putting across the atmosphere – a great live show with a crowd that was loving it, plenty of crowd surfers, and of course great music. Floor does an amazing job as singer, and has been well received by fans. The second DVD is a 2 hour documentary about the tour, which starts with the notice that the former singer (Anette Olzon) has insisted that she not be seen or heard during the film. That straight away makes it clear to anyone who thought the departure might have been amicable, that it wasn’t. It’s as the opening titles start that things go horribly wrong – the whole thing is in Finnish, so you have to turn on the English subtitles if you want to watch it. I realise the band is Finnish, but outside Finland almost nobody speaks the language, whereas English or Spanish are very widely spoken (English covers the US and UK markets and is also widely understood in parts of Europe, and Spanish covers latin and South America). The decision to record the film in Finnish therefore seems crazy and it will put a lot of people off watching it – 2 hours of watching a subtitled film is not my idea of fun. The CD’s are the 90 minute Wacken Open Air show, split across two discs. As with the DVD, the sound quality is excellent. It’s a nice touch to include the concert on CD as well as DVD, and one I’ve noticed becoming more popular – Epica and Alestorm’s recent releases have also done this. It’s a great idea as it means fans can watch the DVD when they have the time to sit down in front of the TV, and when they don’t have that time they can listen to the CDs while doing whatever else they’re doing (as an example I’m listening to the CDs while typing up this review). A great release for all Nightwish fans.